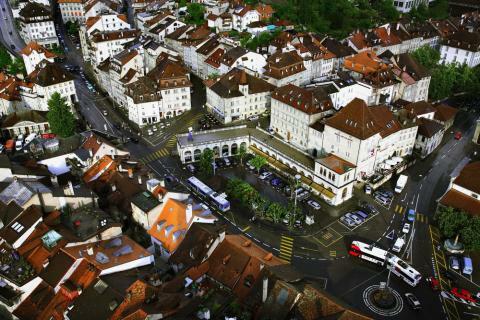 Le Bourg is the historic district of the city of Fribourg. Located on a terrace above a meander of the Sarine, it was built during the founding of the city in 1157. Take a walk across the Bourg and you may see a Zähringen ancestor stick his head out of an obscure windowpane. Sweat it out climbing the Stalden, Fribourg's eastern gate or amble across ages and bridges on the western bank of the Sarine River. High cliffs stand as a natural and quite impressive fortress.